A Noise Within opened the final production of their first season in their new Pasadena home this weekend with Molière’s The Bungler. It was the second 17th-century French play the company has put up this year, the first being Corneille’s The Illusion which continues to run in repertory alongside The Bungler. And while the shows have several things in common, the overall feel of the two are quite different. Most importantly, The Bungler may well be the first show that completely and unequivocally feels comfortable in the troupe's new expanded space. It’s an attractive and very successful show, often despite itself. The Richard Wilbur translation directed by Julia-Rodriguez Elliott maintains Molière’s rhyming couplets in this episodic and somewhat repetitive narrative about a servant whose attempts to bring his master’s amorous goals to fruition are repeatedly thwarted, unintentionally by that self-same master. And yet despite these somewhat outmoded conventions in one of Molière’s earliest plays, The Bungler produces laughs over and over again in the strongest show A Noise Within has done this season. Visually the production explodes off the stage with lights traveling toward the rear rafters of the auditorium. The design flirts with 17th-century staging conventions. All of the cast are seated at dressing tables at the rear of the stage preparing for the performance as the show starts. Curtains can be drawn to cover up this area, but the entire cast is always at hand for all the action and sometimes provide songs and running commentary on it. Period costumes are occasionally accented with masks, and a tuba provides musical punctuation when called for. There are a few recurring jokes, but nothing is ever pushed beyond the point of funny into the realm of the annoying. The riotous fun is largely under the guidance of the wonderful J.D. Cullum who returns to ANW as the servant Mascarille. He's made several appearances in similar funny side man parts and as with this performance he runs away with the whole show. 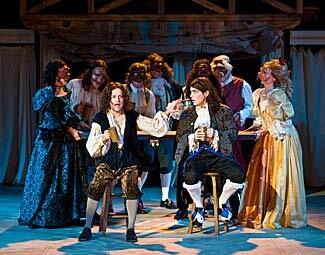 Mascarille has more great ideas than his master Lelie, played by Michael A. Newcomer, can derail in the course of the evening. The pacing is brisk and the tone is kept light without the show becoming too self-aware or cynical. It's another fine show for A Noise Within and one that promises an even bigger, brighter future with the company now fully engaged in their big bright surroundings.